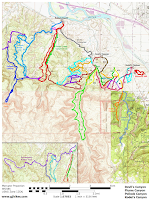 The K7 trail is located in the Kodel's Canyon Area of the McInnis Canyons National Conservation Area near Grand Junction and Fruita, Colorado. The trail begins at the northern boundary and extends for about 1 mile where it ends at the mouth of Kodel's Canyon. 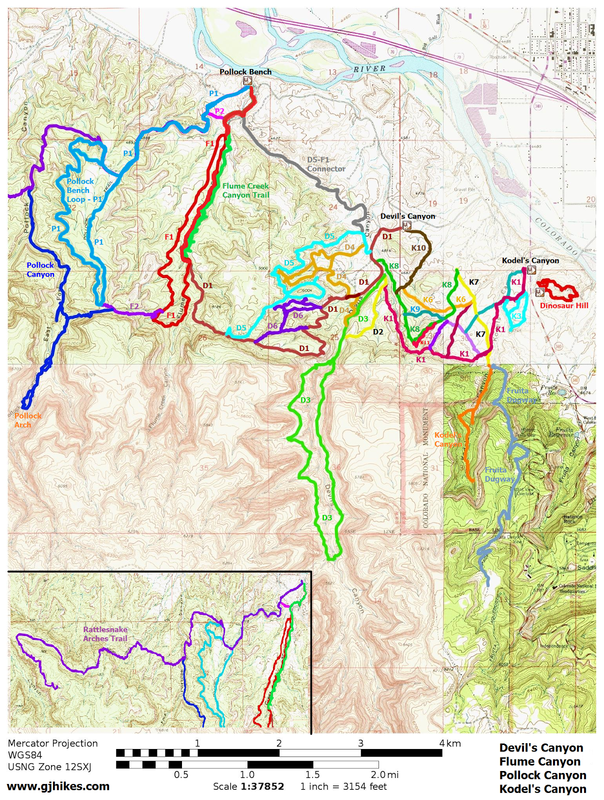 The most common use of the trail is for hikers accessing the Kodel's Canyon trail and for various other trail combinations is the area. We began this post by parking at the Kodel's Canyon trailhead. We could just as well have parked at the Devil's Canyon trailhead and followed the K10 trail to the fence line shown in this photo and hiked a short unnamed connector trail to this point. The land on the north side of the fence appears to be private property judging from a No Trespassing sign about a quarter mile away along the Kingsview Road. Within the first 50 yards there is a fork where the K8 trail splits off on the right and the K7 trail follows the left fork. The trail is wide as it starts out as though it was once a wagon road or jeep trail. After a short initial climb the trail levels out as it heads towards Kodel's Canyon. Just past the quarter mile point the K7 trail is joined on the right by the K5 and K6 trails. And just before the half mile point the K7 trail is intersected by the K2 trail. Near the 3/4 mile point the K7 trail drops down into a shallow wash where the K1 trail makes a crossing. After passing the K1 trail the K7 trail completes a short climb and comes to a point where horse travel is no longer allowed. Several hitching posts are located here for any equestrians that would like to continue on foot. Whether this is the official end of the K7 trail isn't clear. We added the section of the trail between here and the boundary of the Colorado National Monument to the Kodel's Canyon trail. This is also the same point from which we access the Fruita Dugway trail which climbs up to the monument along an old livestock trail. The south end of the K7 trail gets the most use and very few people probably hike it in the manner in which we did which was necessary for posting it on this site. If you would like to see it for yourself then all you have to do is 'Take a hike'.